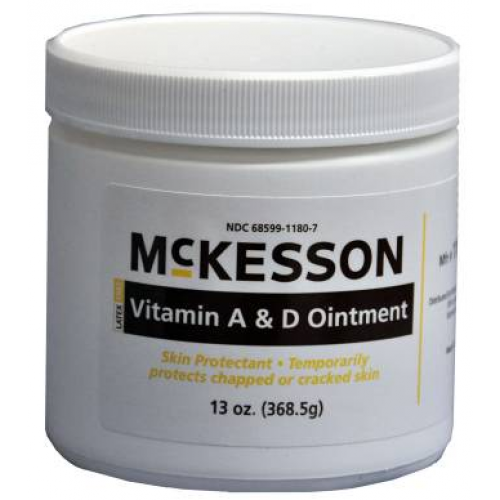 A & D Ointment by McKesson BUY Skin Ointment, A&D Ointment, Skin Protectant Ointment with Vitamin A & D, 118-8712. 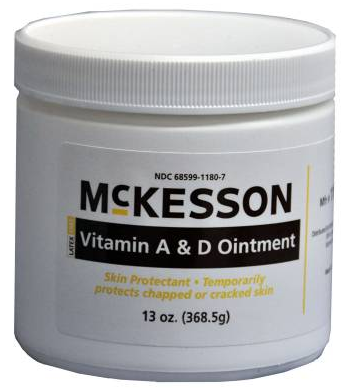 Skin Protectant Ointment from McKesson provides temporary relief for cracked and chapped skin. Also effective for chapped lips, this white petrolatum ointment is manufactured with Vitamins A & D. McKesson Skin Protectant Ointment also protects your skin from the drying effects of wind and cold weather. Offered in 5 gram packets, 4 ounce squeeze tubes, and a 13 ounce jars, this Skin Ointment is easy to apply. Temporarily relieves minor cuts, scrapes, burns. Helps protect skin from the effects of wind and cold weather. 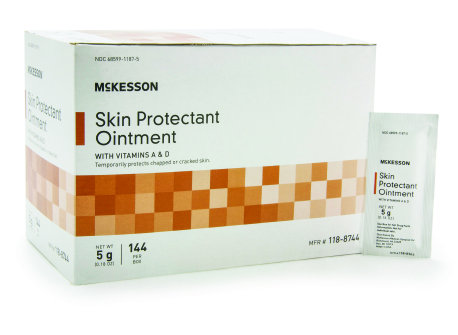 McKesson Skin Protectant Ointment Product Number: 118-8744, 118-719, 118-81400. Size: 5 gram, 4 ounce, 13 ounce. Container: Packets, Squeeze Tube or Jar. Active Ingredient: White Petrolatum 93.5%.